This unbeatable three nights’ break promises you a holiday full of fun-filled moments. Enjoy stress-free airport transfers, stay in your preferred pre-arranged hotel, and mostly, take in the country’s most fabulous sights and experiences during your mini-getaway. The greatest highlight of your holiday is a trip to Kakheti, which is one of Georgia’s most significant wine regions. Immerse yourself in the region’s historic charm and lush scenery, know about the ancient wine making traditions using Qvevri or huge earthenware vessels, and of course, don’t miss the chance to savor authentic Georgian wines. An all-encompassing sightseeing tour of Tbilisi lets you discover the capital city’s awe-inspiring beauty, intriguing culture, and ancient architecture as well as monuments. Lastly, take an amazing funicular ride and then enjoy an astonishing dining experience at Funicular Restaurant Complex surrounded by unrivaled views. Amazing arrangements and great service...will book more packages with this tour operator!! I have been associated with Rayna Tours for quite sometime. So, when I had to plan a holiday with my wife for celebration our 10th wedding anniversary, Rayna was my first choice. And I was not disappointed. The whole tour was customized as per our requirements. Our tour guide at Georgia was friendly and a knowledgeable person. We got to learn a lot about the place. I would say it was a memorable holiday and a special anniversary celebration too. We chose Georgia for our short honeymoon and we are extremely glad to have done so. This tour package was tailormade for us. We enjoyed the wine tour and the city tour as well. 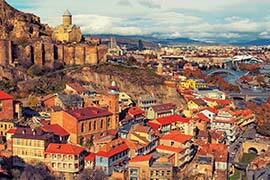 The city of Tbilisi is extremely beautiful, and we have really fond memories of the place. The best part of the holiday was our dinner at the Funicular Restaurant. The ambience, the Georgian food and the view of the entire city made it a romantic night for us.